You choose which football games you want to attend. Three papers and a midterm all due on Monday? We don't mind if you take a weekend off. All we require is that you attend a rehearsal the day before the games you do plan to attend, since we play new music and perform a new halftime show every week! You travel with the Band to exotic places such as New York City, Philadelphia, and Ithaca. We go where the teams go—all in the name of steadfastly supporting Harvard athletics. You lounge in the band room. Fully equipped with all types of games, free soda, and air conditioning—there's no better place on campus. You sport a cool crimson blazer. The jacket flatters any figure and will get you into Harvard sporting events for free—for life! You perform songs by anyone from Britney Spears to Bon Jovi. And if the musical muses whisper in your ears, then try out your own arrangements. Everything we play is student-arranged and we are always eager to encourage creativity. You are a part of the halftime show at yale. Be there. Even if you don't play an instrument, you can still join the Band! Our illustrious Prop Crew documents the Band's endless shenanigans on film and in photos—plus, they are charged with the venerable task of guarding Bertha, our six-foot bass drum. They enjoy the full membership benefits of the Band, but without the rehearsals, spit valves, and broken reeds! And Prop Crew shines at the yale game, where they fashion anything from catapults to Trojan bulldogs to enhance the Band's halftime show. Also, be sure to read our list of Frequently Asked Questions. Excited? Sign up for an audition! 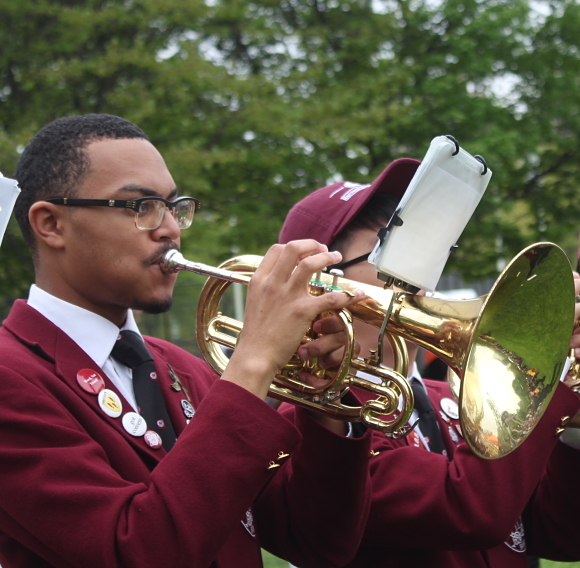 A single audition is sufficient to try out for any combination of marching band, wind ensemble, and jazz band. 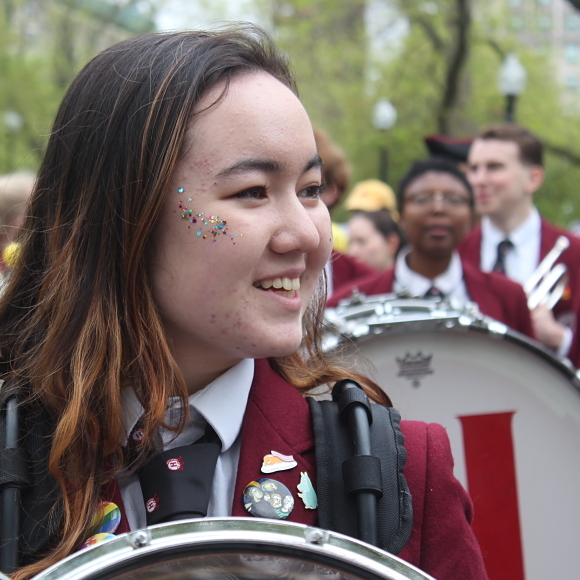 NOTICE TO GRADUATE STUDENTS: Although the ensembles at Harvard College are intended for the participation and experience of undergraduates, the marching band currently has two graduate-student members. Playing/performing/coaching opportunities are available for qualified graduate students if a qualified undergraduate is not available. 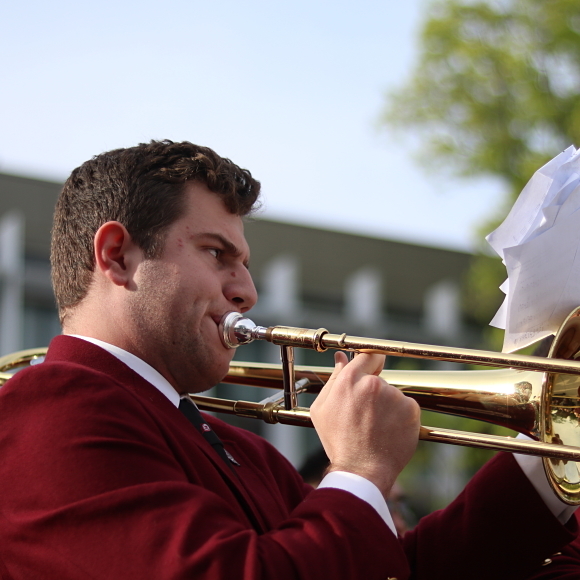 Contact Lucaian Al-Tariq at manager@harvardband.org for more info on prospective graduate participation. 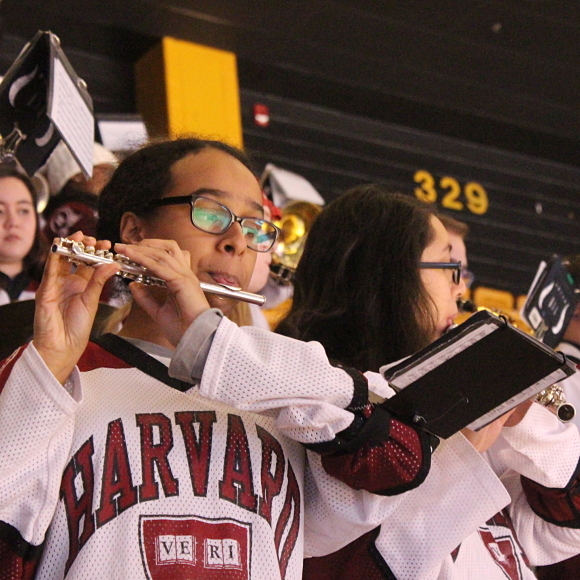 In any case, graduate students interested in doing more performing should contact Mark Olson (meolson@fas.harvard.edu; 617-496-2263) so that he knows of your experience and interest, as he is often called to recommend musicians for a variety of performance needs in the area.